Chocolava works perfectly in chocolate fountains as it doesn't harden, and has a continual flow. You can use it in fountains, fondues, truffles. Fantastic on ice cream, fruit, pretzels.. just about anything! Chocolate makes everything taste great in my book. We received a sample of the chocolava and the peanutta to taste test. We used bananas as our means to an end! In front you see the chocolava, and behind is the peanutta. The chocolava was a huge hit! They kids loved it! What little taste I got I loved also. The peanutta wasn't as big of a hit. I think when given the choice our family will choose chocolate each time. The peanutta tasted fine, like a thin peanut butter. I think they would have been great combined like a peanut butter cup. Real chocolate, not artificially flavored chocolate like many fondue or ice cream toppings are. 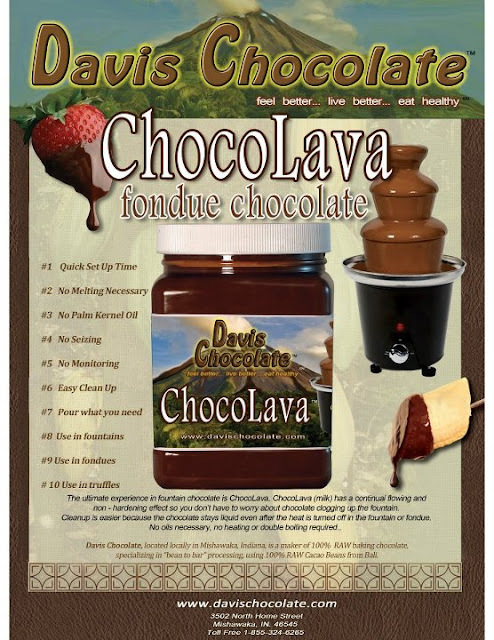 "Davis Chocolate is a family-owned business that was formed to provide a chocolate with a superb flavor, aroma, and complexity with an exceptional taste. One of our goals is to allow our chocolate to accentuate the special moments in your life. We have developed a distinct chocolate taste by combining a healthy chocolate product with high antioxidants. Our chocolate has a full-bodied flavor along with an excellent value for the dollar. We are on a journey at Davis Chocolate to help our customers be healthy, stay energized, feel alive, and capture all the benefits that have been given to all of us in this life - and on this land. In today's chocolate market, it seems that there is a gap between the home chocolate consumer and the corporate chocolate manufacturers (typically large companies)." Oh my goodness, that looks SOOOOOO good! Thanks for the review! I bet the white chocolate is spectacular!